The most important consideration when using a firewire audio interface is the firewire chipset of your firewire connection. You'll find that this is generally a requirement of any manufacturer of any firewire audio interface. Different firewire chipsets handle data differently, and some are better suited to the requirements of streaming multi-channel real-time audio. While Macs with built-in firewire ports do use a supported firewire chipset, finding a PC laptop with built-in firewire can be difficult, and even then, most PC laptops with built-in firewire use a firewire chipset that is incompatible. Because of this unfortunate fact, the main requirement then becomes that the laptop has the ability to add a firewire connection which uses a supported chipset. You may be able to find Firewire to USB adapters, and they may work for connecting external hard drives or cameras and other peripherals, but generally speaking, they will not work for audio interfaces. The primary, and for the most part only way to add a supported firewire connection to a laptop is with a firewire expresscard adapter. In most cases, to find a laptop with an expresscard expansion slot, you'll need to look at the "Business" class laptops from the major manufacturers. Check out the tech specs for each model to make sure though. For more information on the ExpressCard standard, check out this article. Anything with an expresscard slot has good chance of working, but even with an expresscard slot there's still a possibility for other problems or incompatibilities related to PC Laptop hardware, Windows hardware enumeration and communication, misbehaving device drivers, or other issues with the Windows Operating System. It's highly recommended that you do some research in various audio recording forums for suggestions on what PC's people are having success with. 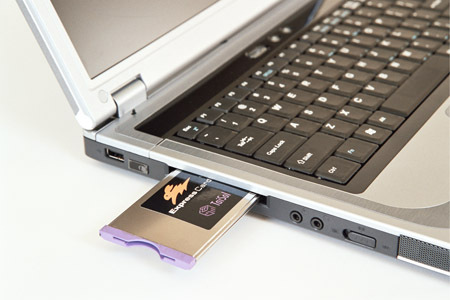 The following laptops are ones that have expresscard slots so that you can add a supported firewire expresscard adapter, allowing you to connect a firewire audio interface. NOTE: These are NOT recommended systems tested and certified by Presonus. They are merely laptops that have the potential to work for this purpose, but again, there are no guarantees that any of these particular models will work well as an audio workstation. When researching just make sure to check tech specs on any laptop to see if it has one of these slots (preferably expresscard), and check firewire cards for compatible chipset (preferably a TI chipset from the list). Again, chipset is key, so be sure to double check as manufacturers sometimes change the chipsets they use.